Norman Pearson has been the tubaist with the Los Angeles Philharmonic Orchestra since 1993. 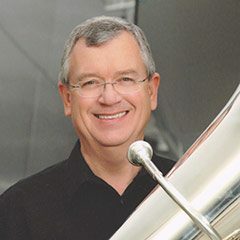 Norm Pearson has been tubist with the Los Angeles Philharmonic (LA Phil) since 1993, and has served as principal tubist with the Orquesta Filarmonica de Caracas. Prior to his appointment with the LA Phil, Pearson was a freelance musician in the Los Angeles area who performed regularly with the Los Angeles Philharmonic, Pacific Symphony, Joffrey Ballet, Los Angeles Opera, Los Angeles Chamber Orchestra, and more. He has worked with most of the major Hollywood motion picture and television studios. He is on the faculty of the USC Thornton School of Music as well as the Colbun School. Previous teaching posts include the California State Universities at Long Beach and Fullerton and Biola University. A native of Los Angeles, Pearson earned his Bachelor’s degree at the University of Southern California where he studied tuba with Tommy Johnson, Jim Self, and Roger Bobo.